Come visit at the Pittsburgh Comicon! 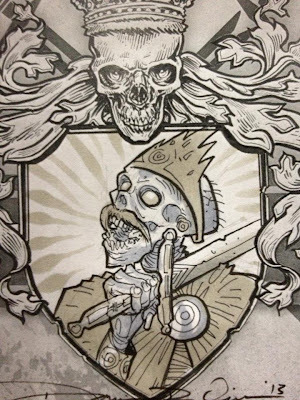 The Pittsburgh Comicon is once again upon us, and as is my civic duty as a Pittsburgher, I've set up the Wagon Wheel Comics booth and will be in attendance all weekend in the small press section, right next to the FUBAR booth! If you're in the area, come by and see both me and also a bunch of other people that are infinitely more recognizable. They will be more recognizable, that is, until the panel that I'm a part of takes place. Also, I'm part of a panel this year. I am! The panel, cleverly titled "Small Press Publishing" and featuring both Jeff McComsey and Steve Becker in addition to myself, takes place on Saturday the 28th at 4:00 pm in room 3 of the convention center. After the panel ends...they CLOSE THE COMICON. I think that means they have high expectations for it. The show is already a day old, and I have a few things to show for it, including this great Barry Kitson Thing sketch. It's got a good story behind it, too, which is part of the fun. The convention is open on Saturday from 10:00-6:00 and Sunday from 10:00-5:00. Drop by for a little bit and say hello! Or other words. Comic-Con International closed on July 21st at 5:00 pm, and what a sad time it was. I feel that the event is, save for a couple hours on Sunday, as long as it can be. I mean, Comic-Con could last an entire week, from Sunday through Sunday, and it'd be just lovely, but most people do have jobs and other commitments that would probably keep them from spending eight days at the event. Such is life. At any rate, I am already looking forward to next year and what is certain to be an even greater event. I left San Diego on Sunday tired but filled with the satisfaction of a convention well traversed. As wonderful as Comic-Con is, it seems that every second spend there revolved around the show; there isn't time for anything beyond what's connected to the convention. Just as I did last year, I took a few days afterwards and did some sightseeing in a nearby city. Last year took me to San Francisco with stopovers in Los Angeles and Oakland, and this year I drove east out to Yuma and Phoenix, Arizona. There were some pretty cool things to see there, and I thought that I'd wrap up these Comic-Con pictures by posting some of the post-convention photos, most of which have at least something to do with comics. Oh, and cactuses, too. Did someone say cactuses? The word that is just as acceptable as "cacti"? Well, it is well known that I have a great love for the spiny desert plants. And boy, were there some specimens to see as we drove east. The above picture is from Yuma, right across the border from California. It was amazing to see the scenery change so quickly after we left San Diego - it wasn't an hour before the climate changed from breezy and temperate to hot and arid. Hey, it's another, absolutely gigantic cactus! I'm in this picture to give it some scale, and because I like to have my picture taken. You might have thought that coming right from Comic-Con, I might have been able to skip a trip to a local comic shop, but no, once Wednesday rolled around, I drove to Pop Culture Paradise in Tempe. 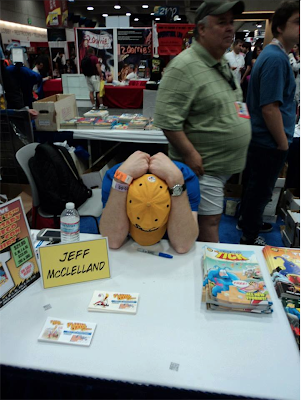 I took a couple copies of Teddy and the Yeti and the Tick to leave with them. It was over 110 degrees Fahrenheit this day. The shop was pretty big with lots of different displays. There were more than a few people walking around when I showed up. They had all of their new comics lined up on a wall, and had a small back issue section as well. I picked up a few comics and browsed. I find that I've taken pictures of a number of comic shops for the blog in the past, and I always feel like at one point someone's going to catch me doing it and think I'm some corporate spy or something. Not this time, I guess. The shop had a really nice action figure section with both new and vintage toys. There were even some video games and snacks! This is a great store for events and killing time. It's not just a place to buy comics and leave. A large section of the store is devoted to gaming, too. This was the most...interesting?...piece in the store. "Hey, kid, you want a terrifying bust of Harrison Ford as Han Solo?" There were a number of high-end items as well, such as this super Thundercats statue. It was a fun store! I'm glad that I got to stop in to pick up my weekly comics. On the way to my hotel, I saw this Dukes of Hazzard-themed saloon, which I'm sure made Larry extra jealous. On one of the last nights I spent in the area before flying back to Pittsburgh, I went to the Phoenix Art Museum, which coincidentally, had a gallery on video game art! The whole museum was very cool, but one of the really neat things was the arcade they set up in the museum, with working games that you could play for free. The video games all came in custom-painted cabinets, pained by local artists and re-imagining the original cabinet design. There were all kinds of classic games, from Mario Bros. to Pac Man to Gunsmoke to Rampage to Teenage Mutant Ninja Turtles to this X-Men game, which seemed especially popular. Hey, there's Colossus doing that weird thing that he does in the video game that has no basis on his actual powers at all! And, for some reason, here's original Cyclops. He and Professor X look like they are taken from some John Byrne artwork, though I couldn't say exactly where. The TMNT cabinet looks pretty cool, until you get down to April O'Neal, who is apparently...being molested? Here's a high-angle shot of the exhibit floor with video game systems from all over, old and new. There are always some great pictures to be had at Comic-Con, and I hope that you've enjoyed all of the ones I've posted from this year's trip. Here's some good news - I've already been approved for a professional badge for the 2014 show, so as long as I manage to claim one in time, I'll be going back for another round next July. And, yes...I'll take pictures. Lots and lots of pictures. If you see a headline like the one at the top of this page, you probably think that I'm going to go on (and on) about Franks and Beans. But that is not the case! I mean, people do love me on Franks and Beans. They do, right? I think so. Anyway, what I'm referring to is yet another great moment from Comic-Con, specifically the two Nerd HQ panels that I was able to attend. Fortunately for those not in San Diego at the time, all Nerd HQ panels were broadcast live on YouTube and have been archived for posterity. Due to the intimate settings of the panels (there were 250 tickets sold for each), chances are that if you were in the audience, the on-set cameras captured your image at one point or another. In my case, I was able to attend the Joss Whedon panel and one of the two Nathan Fillion Panels. Fillion actually hosted the Whedon panel as well, and Alan Tudyk played host at the Fillion panel, so I got to see twice the facetime with Firefly alums than I had expected. The panels were, at their core, question and answer sessions. This was exciting because, among other reasons, you actually had a chance of asking a question here, as opposed to a Hall H panel at Comic-Con's convention hall, when spots to ask questions are snatched up two nights before anyone even shows up. Several staff members were available with microphones, and we were told early on that, if we had questions to ask, we should let someone with a microphone know. I didn't act soon enough and was left waiting at the Whedon panel, but I did still get on camera a few times. Pretty cool! As you can see in the video, Whedon was cool and cordial throughout, and Fillion was his normal jovial self. 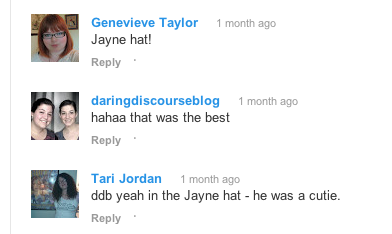 I wore my Jayne hat because, I don't know, it's a Firefly panel at Comic-Con, so I'm pretty noticeable in the crowd. Because of this, I'd often see myself in the crowd shots on the big monitors in front of the stage area, and like a person who apparently has nothing better to do than take his attention away from a very exciting event to mug for the camera, I did...well, just that. So that was pretty fun. And thanks to all the random people who...uh...noticed me? I certainly appreciate it. Next up on the circuit was the Nathan Fillion panel with special guest Alan Tudyk, the second such panel of the day. There was no video bombing in this panel (at least by me), but I did get to ask a question! And also I looked very dashing in my brand new Pirate hat. I'll admit that my question wasn't the most inspired, because I tried to rearrange the question that I was hoping to ask Joss Whedon the day before. But dammit, I knew that I had to ask a question, and if I was going to ask a question, it was going to be about Firefly come hell or high water. Obviously, YouTube or not, this was a great time. I can't wait to try to go back again next year. Maybe I'll be able to pop up in front of the White Queen again. We're nearing the end of my store of Comic-Con pictures; I find that I probably took more pictures last year, but in 2013 I did more things and took in more events. If that meant that I didn't use the camera as much, then I suppose it was well worth it...though I did get some pretty cool pictures. All of these pictures were taken on Sunday of the event, when everything was supposedly winding down. Even though it was the last day of the show, fans were still out en mass, events were still happening all over the area, and the goodwill that seems to pervade Comic-Con was still felt. I've only been to Comic-Con three times at this point, but the changes that have happened since attending in 2006 and 2012 have been measurable, to say the least. The number and scope of off-site events is pretty astounding, to the point that I wonder if outside Comic-Con will be different than regular Comic-Con in another 10 years. Hours of events have expanded, too. Case in point, at 5:00, after the convention officially closed and I said goodbye to another great year, people were still pouring into a video game site, just across the tracks, that was staying open until 7:00. So even when Comic-Con was over, it was still going on! It's been a real privilege to get to attend this show, first as a small press exhibitor and now as a professional. I realize that Comic-Con is really unlike anything else, and I hope that more people get to experience it in the coming years. It's difficult to really define or explain unless you've been there for yourself. But enough pontificating...let's see some pictures! At top, you might recognize the cast from Saga, probably the best book being published right now. Even the baby had a costume! Brian K. Vaughan has a signing for Sunday morning, and these guys lined up to meet him. We had our own event picked out for Sunday at noon, so we had to head over to Nerd HQ shortly after arriving at the convention center for the day. On the way there, near the incredibly packed Game of Thrones off-site exhibit and store (people were waiting two hours in line just to get a t-shirt), I ran into none other than John Bradley, otherwise known as Samwell "the Slayer" Tarly, in his own mobile Iron Throne. He was filming some bonus material for an upcoming DVD, and I'm sad to say that I didn't get the chance to run in the background during any of it. That would've been something. At noon, I was lucky enough to get into my second Nerd HQ panel of the weekend. This panel was Nathan Fillion's and wouldn't you know it, fellow Firefly cast member Alan Tudyk was there to host it. I can't express strongly enough how great the entire Nerd HQ experience was this year. It was absolutely worth it to buy tickets to these panels (the proceeds from which went entirely to charity) and just experience the ambiance of the event. Zachary Levi puts on a tremendous show and I can't wait for next year's lineup. After the panel, Fillion and Tudyk (seen here hiding behind Kung-Fu-Fillion) came out and took pictures with fans, raising even more money for Operation Smile. Keep in mind that Fillion is a bonafide super-celebrity and cult figure in the world of television. That these two guys came out and put the time in to meet people was pretty exciting. Also, I almost ended up accidentally stealing Alan Tudyk's glasses as I left the event (true story!). I was able to get Tudyk and Fillion's signatures on a couple items this day, which by all accounts is a difficult feat to accomplish. Both were gracious and more accommodating than they needed to be. The panel, pictures and signing were definitely highlights of the entire weekend. And of course, no Comic-Con is complete without the obligatory Chewbacca sighting. There were only a few hours left of the show by the time we got out of Nerd HQ, but we managed to make it back to the convention center to do some last minute shopping and signing. Here's the A-Team van, parked near the Mattel booth! Hannah Nance Partlow, Boom! 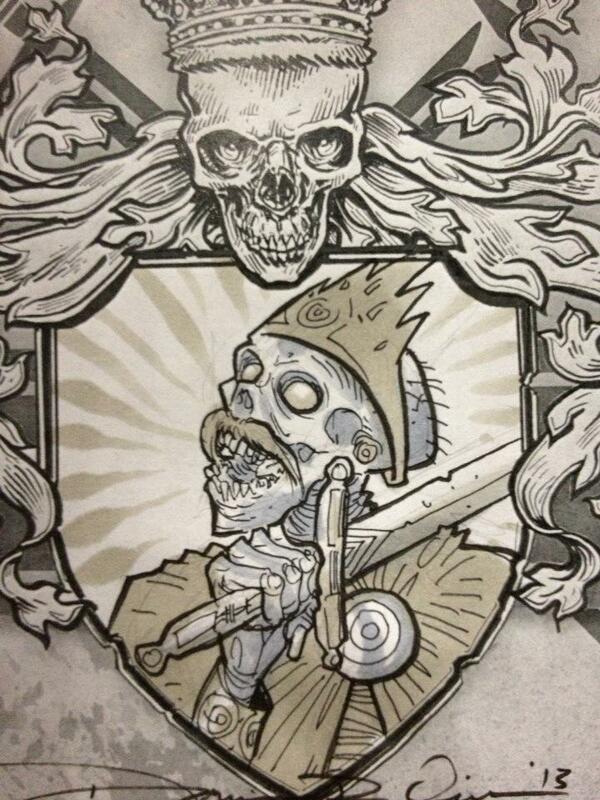 Studios letterer, artist and designer, added this new image to the ol' Thing sketchbook! It's the first inclusion of Miss Thing in the book, and one that I was hoping to get (it'll keep the one drawing of She-Thing company). Hannah did such a great job that I had to get a picture of it right away. I spent the last hour or so of the convention at the New England Comics booth, signing and handing out copies of the Free Comic Book Day Tick book. While I was there, I spied some holy grail items for Tick fans - original Ben Edlund pages of artwork! 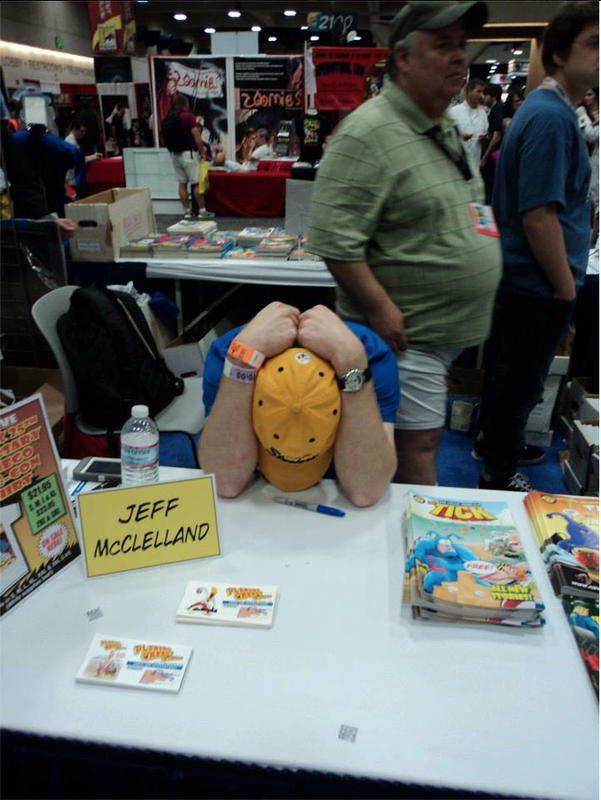 Ben had given a few to the art director's nephew (seen below), much to the envy of everyone else at the booth. How great it'd be to own a page like this, and what a classic scene! Here I am with Gabe Crate, Tick alumnus and screenwriter. Benn and Liz Robbins stopped by before too long as well, and Edlund himself made one quick stop as the show was winding down, so it was a mini Tick reunion for about 15 minutes at the booth. The table saw brisk sales the whole weekend, from what I was told, which is a great thing. There needs to be more Tick in the world. After the show ended, I walked past the Godzilla Experience one last time, and I took this shot of the outside of the building. I wonder how long this warehouse will just have a painted Godzilla on the outside? This takes us to the end of the show, but I've still got a few more pictures to share from the remainder of my trip to the West coast. Look for those soon! 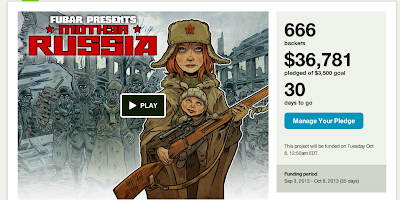 Support "FUBAR: Mother Russia" on Kickstarter! 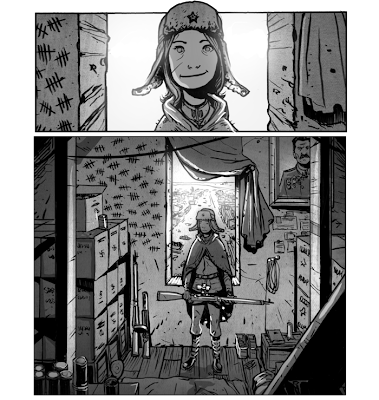 The newest FUBAR Kickstarter has hit the ground running, and by the looks of things, it's already a rousing success. FUBAR: Mother Russia is FUBAR's first full-length, stand-alone graphic novel, written and illustrated by EIC Jeff McComsey. Mother Russia follows a Russian dancer in 1943 as the faces two million zombies armed with only a singe rifle. The first chapter of Mother Russia appeared in the very first volume of FUBAR back in 2009/10, and it is a story that I always hoped to see finished. After volume three and as the current By the Sword series comes to a close, Mother Russia will pick up the slack in a big way. 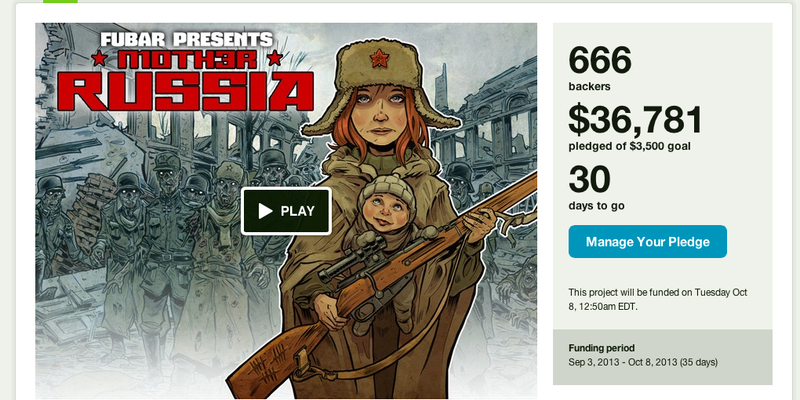 That's right: a very demonic 666 people have backed this project, pledging an ungodly sum of over 36 thousand bucks. And here's the really incredible thing: this is after only five days. There's still nearly a month to go! Incredible. Just because the book's print run has been funded, though, that doesn't mean there aren't still good reasons to back this project. First and foremost, you can land a copy of the book. Beyond that, there are some great rewards to be had, and there are some more on the way that will only be available through the campaign. Keep it on the down low, but I just might have something to do with one or more of the upcoming stretch goals.